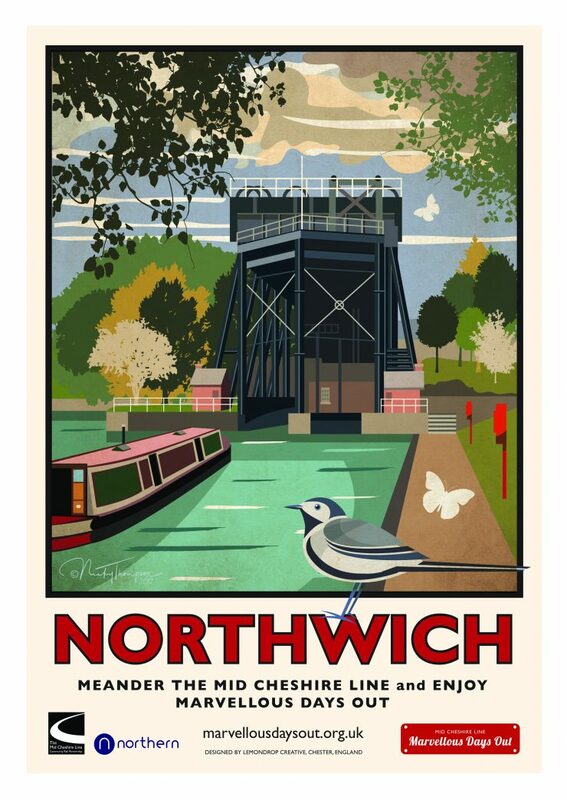 “You will not be disappointed with your trip to Northwich with its many hidden delights. Bradshaw’s 1863 Handbook recommends a trip to Northwich. In 1863. it was for the curious traveller to visit the Salt Mines and excavated chambers. Today there is still plenty to unearth in Northwich because salt and the chemical industry have become its heritage. Whether by bike or on foot, you will enjoy the Northwich Woodlands which sit between the Weaver Navigation and the Trent and Mersey Canal. Nearby is the iconic Anderton Boat Lift, known as the Cathedral of the Canals, which opened in 2002 as a visitor attraction. Opened in 1875, it was a wonder of its day. Now you can enjoy a boat trip down the Lift on the glassed sided Edwin Clark boat which takes you 50 feet from the Canal to the Navigation. There is also the visitor centre, a café, gift shop, picnic and play areas which are free to enter. Another way to find out about Northwich’s rich heritage is to take our Northwich Rail Trail, which provides for a visit to Weaver Hall Museum. This former Victorian Workhouse is also accessible from our walk from Greenbank Station overleaf – which is the next station on the Mid Cheshire Line. Your Rail Trail from Northwich takes you beside the Weaver Arches that dominate the Northwich skyline. Alongside the arches is Vickersway Park where you can stop off for an ice cream or perhaps more? Crazy golf, tennis, bowls or even a visit to their outside gym or skate park. Whilst a visit to Weaver Hall Museum to learn about Northwich’s past is a must, be sure to carry on the Rail Trail. You have still got the River Dane to walk alongside and St Helens Church to visit. Yes, Northwich has a lot to offer its visitors.